Click the button below to add the 12 inch double sided diamond grinding disc to your wish list. 12 inch diameter machined electroplated steel diamond grinding discs that attaches to a potters wheel like a bat. Both sides of the thin discs have a diamond grinding surface, one medium/coarse (120 grit), and the other fine (400 grit). It works like a slower speed lapping disc or lap grinder, and can be used to smooth gemstones and glass and sharpen tools. No assembly, it is ready to use. Works for high fired porcelain, stoneware or bisque. Each disc is machined flat before electroplating for an even, very effective operation, and evenly distributed consistent grit particle size. Electroplated diamond tools vary wildly in quality. These are guaranteed to be the highest professional quality. Use only the included special low-head bat pins, 1" in length, to attach the disc to the potter's wheel . Regular bat pins will stick up above the surface. If your wheel requires 1 1/2 " bat pins, e-mail or phone and I'll send those instead. There is an additional option of a 12" X 1/8" plastic bat that raises the height of our discs if you prefer to use your existing bat pins. Shipping for this item is via USPS Priority Mail. If you want another shipper, please call 559-542-2203 and order by phone. 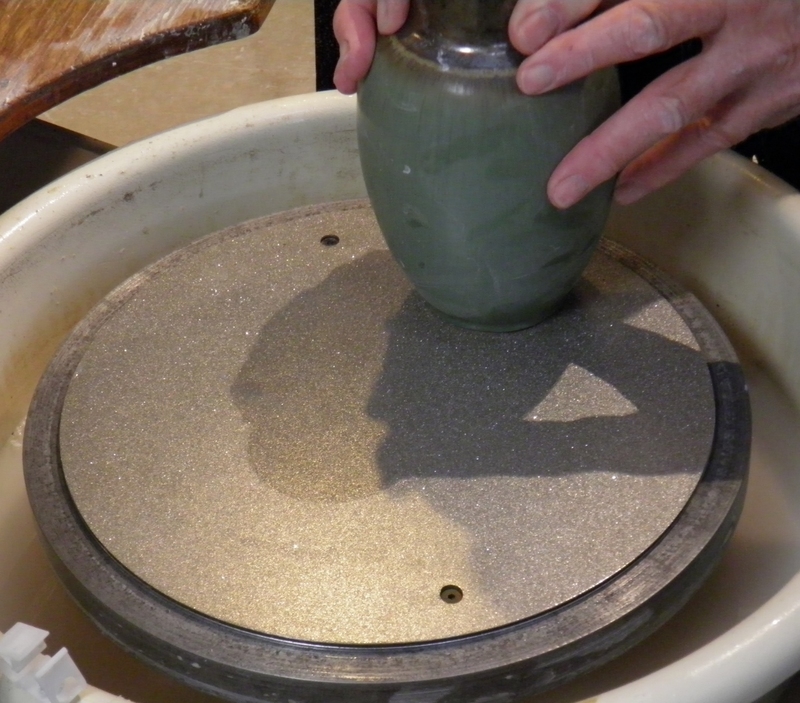 I use the disc to flatten the bottoms of all my bowls after the bisque firing. It's a lot easier to do the sanding/grinding in the bisque rather than after the ware has been glazed. This grinder works very well for this purpose.